"I have been interning at an Oxford law firm called Robinson, Lipnickey and Jones, LPA since August 2015. Maria Vitullo helped me secure this internship, as she'd told me that a law firm internship is very helpful for going to law school. It really solidified my decision to go." "When I was a senior in high school, a Miami representative came and spoke to my class. I knew I wanted a university with a pre-law program, so I was impressed. I went on a couple campus tours and participated in Make it Miami, both of which cemented my decision to come here. "My first year was very bittersweet. I lived a little over 3 hours away, which was a considerable distance from family and friends and everything I was familiar with, but I was excited to get started on my path toward law school. Miami was a different environment, and I really liked having to take responsibility for myself and becoming more independent. "Miami does a great job of providing an environment that is not too overwhelming for freshmen at once. You have all this freedom in front of you, but you still have the structure and the teachers who will make it a point to care and work with you." Shannon LaGassa poses with her horse. 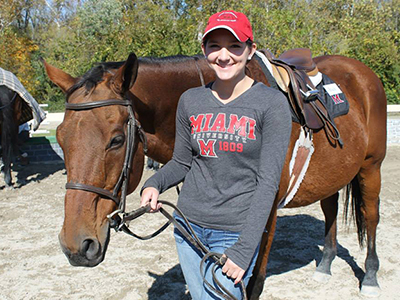 "I've enjoyed my time on Miami's equestrian team, which I joined my freshman year. I ride on the Western team, where we focus on communicating well with the horses and recognizing how to handle each individual horse in the best way possible. I grew up riding, so it was nice being able to transfer my previous knowledge into my college experience. I've made a lot of close friends on the equestrian team, even though we're also competing against one another! "Another great Miami experience has been working as a communications intern with the College of Arts and Science, which I began my junior year. This has been really good for me as a [English] Professional Writing major, since it's allowed me to expand my horizons beyond writing college essays or formal, research-based papers. For this internship you need to be able to draw the attention of your audience and put an interesting spin in your articles. It's also helped me meet and make connections with a lot of faculty members that I didn't know before. "What I really like most about Miami, however, is the people. They are very open and friendly. I've had people push me, inspire me, and comfort me when I was feeling overwhelmed. Everyone is willing to work with one another and make new bonds, and this creates a very encouraging environment overall. "Some of the most important people at Miami have been my incredible teachers and mentors. I took the Intro to Law pre-law class my freshman year with Maria Vitullo, the director of the Pre-Law Program. This was really important to me because while I had some idea of what being a lawyer was like, I wasn't familiar with the law school admission process. Maria's class gives a great introduction to law as well as some great information about how to get into law school. She's such a great resource for students and helped me get my law firm internship Uptown. She also sat down with me to explain what I need to do to submit a law school application." 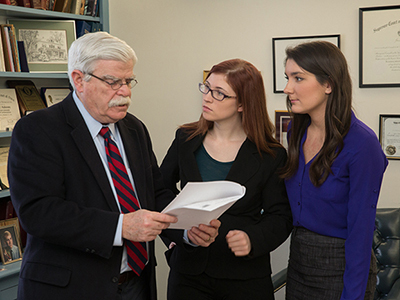 Attorney James G. Robinson examines a legal brief with interns Christina Romine and Shannon LaGassa. "I have been interning at an Oxford law firm called Robinson, Lipnickey and Jones, LPA since August 2015. Maria Vitullo helped me secure this internship, as she'd told me that a law firm internship is very helpful for going to law school. It really solidified my decision to go. 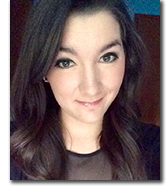 "I learned about the opportunity on the Pre-Law Program's listserv. After I sent Maria my resume, she actually gave me some advice to change some things around to make it look better. I was contacted for an interview, and Maria sat me down to help me prepare. And then I got the job! "As law interns, we do a lot of reception work, but we also get the opportunity to occasionally visit courthouses with the lawyers. This is truly incredible because it gives you a great idea of what to expect in the future. My personal preference is criminal law, so a criminal lawyer has specifically started taking me to criminal cases. While there aren't many high profile criminal cases currently in Oxford, it's still a wonderful opportunity to get a glimpse of what my future will look like." "A liberal arts major gives you a whole new skillset that will help you expand your horizons to accomplish a lot of different goals. That foundation allows you to be a good student and excel in life. "Miami emphasizes the importance of writing skills. If you're a good writer, you can go anywhere, and lawyers especially have to know how to write. If you mess up a document, for example, you waste a lot of time — not only your own but others' as well. After all, people have lost their jobs over mistakes in written documents, so you need to know how to write and edit! "I started at Miami as a Political Science major because I thought it would be the best way to advance my law career, but then I took a required primary English composition course, and that encouraged me to pick up an English major as well. It was a really open and relaxed class that really fostered discussion and debate. We could read and write whatever we wanted, so I decided on focusing my major into professional writing — this to me is the major that is most geared toward legal writing and becoming a lawyer. The professional writing major exposes you to all different genres of non-fiction writing, including legal, business, rhetoric, and journalism. You can see all the different spectrums of it. By matching that major with political science, where I learned the history of government and different political platforms, I felt I had the perfect preparation for going into law. "My criminal justice class was particularly fitting for me because I want to go into that type of law. Getting my basis of knowledge about different law procedures is preparing me for the career field." "If you have an area of study that you really like, there are ways to stick to it, even if it's outside your chosen major. That's what is so nice about having a liberal arts education. There are always plenty of classes out there that will accommodate that, even for an interest outside your major, such as photography or art or a language. "Always check listservs for information on internships and other opportunities, as you never know what will be lurking. These opportunities are especially pertinent to Miami students because they are usually provided by companies that prefer Miami students in particular. I learned about both my internships this way, so being attentive really pays off. "Most importantly, make sure you foster connections with fellow students, professors, and advisors; you'll be surprised how much they want to help you! Get involved in everything on campus. We have such a wide variety of clubs and sports that you can certainly find something you'll love—and that includes employment opportunities as well!" Miami's Henry Pre-Law Center educates students about law school and the practice of law, and equips those who apply to law school with the tools to succeed in the law school admissions process. Students receive focused guidance and counseling, and are provided with opportunities to learn from and network with professionals.